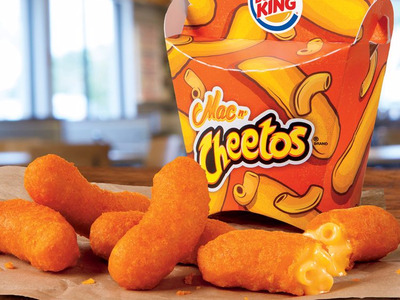 Burger King will soon be serving up Mac n’ Cheetos — creamy mac n’ cheese deep fried into Cheeto-shaped sticks, then covered with crispy Cheetos flavoring. The fast-food chain will begin serving up the menu item for a limited time on Monday, June 27. The Mac n’ Cheetos will be offering in packs of five pieces, with the recommended price of $2.49. “No one understands snacking better than Cheetos, and our expertise at Burger King restaurants’ is serving guests on the go, so it just made sense that we come together to reinvent this favourite food like it’s never been done before,” Axel Schwan, Burger King’s executive vice president and global chief marketing officer, said in a statement. The new snack represents a creative — or, depending on your perspective, absurd — new take on the trend of portable snacks in the fast-food industry. Items such as Burger King’s grilled hot dog and KFC’s to-go cup are doubling down on busy consumers who want to be able to eat on the go — something that is traditionally a challenge for mac n’ cheese lovers. The mashup snack is also a continuation of PepsiCo snack brands’ entrance into the fast-food industry. Doritos have been an industry favourite, with menu mashups such as the Doritos Locos Tacos and 7-11 Doritos Loaded. Site highlights each day to your inbox. Follow Business Insider Australia on Facebook, Twitter, LinkedIn, and Instagram.